The insane scientist Andross was exiled on the planet Venom many years ago, but he continued his experiments and raised an army. Now his war machine is rolling across the Lylat system. General Pepper of the Cornerian army contacts the mercenary team Star Fox to slip through Andross's defenses and lead an assault on the planet Venom. 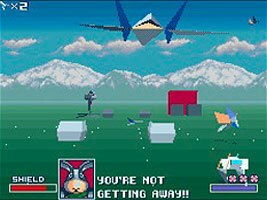 As Star Fox's leader, Fox McCloud, you must fly your Arwing through the Lylat system, taking out enemies and completing missions on each planet. Your Arwing can brake and boost, and holding the L or R buttons makes you bank to fit through narrow areas. The Arwing comes armed with an upgradable laser and Smart Bomb capabilities. The name of the Arwing is a reference to Argonaut, the British game company that developed the Super FX Chip and the Star Fox game engine.